The term failure to thrive (FTT) can imply very different conditions, depending on the context. To a general paediatrician, it might conjure up a respectably clad child, sitting on an anxious mother's lap as you study growth charts and test results in the hope of inspiration. To a social worker it might imply a wasted, miserable child found in a cold, dirty house. These differing images reflect not just the wide range of children who might receive the label “failure to thrive”, but also a diversity of ideas about what FTT is and how it should be managed. The term was first coined to describe a syndrome of delayed growth and development also called the “maternal deprivation syndrome”.1 Although it is now accepted that FTT has a predominantly nutritional cause,2the implication of an association with emotional and physical deprivation persists. However, all the early studies were of highly selected children, referred to hospital, and it is only in the past 15 years that population based studies have been conducted. What light have these studies shed on the subject and what implications do they have for practice? In clinical practice, the diagnosis is more likely to be based on a fall down the centile chart. The problem here is knowing how much centile shift can be expected in normal infants. 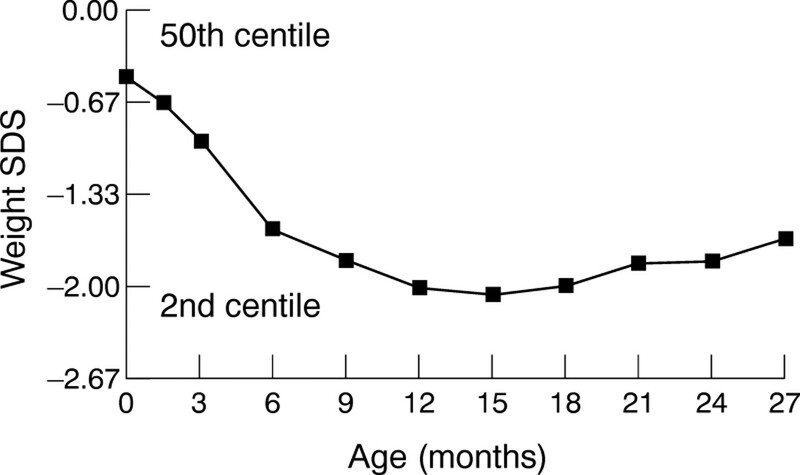 Infants show considerable variability in the early weeks, with 5% shifting up or down two intercentile spaces between birth and 6 weeks of age. A centile space is equivalent to the distance between two major centile lines on the UK 1990 centile charts (0.67 SD scores). Three centile spaces = 2 SD scores. From 6 weeks onwards, there is less variability, and only 5% of children will cross through two intercentile spaces between then and the age of 1 year,6and only 1% will cross three centile spaces.7 This guidance applies only to contemporary standards (UK 1990) because earlier standards show substantial variations compared with present weight gain patterns.8 An additional problem is that very large and small infants regress to the mean: 5% of children on the 98th centile will fall through three centile spaces, whereas only 1% of children on the 2nd centile will fall through two.7 If one does not allow for this, an excess number of large babies will be identified as having FTT, and very small children will be missed. For research purposes, we developed the “thrive index” to provide a linear measure of weight gain, adjusted for regression to the mean.6 For clinical application, this has been used to develop the “weight monitoring chart”, which incorporates an automatic adjustment.9 We have shown that this improves the accuracy of diagnosis, particularly in more severe cases.7 For practical purposes, the definition we have used is equivalent to a fall through two centile spaces for mild to moderate failure to thrive (slowest gaining 5%) and three centile spaces for severe (slowest gaining 1%). In our clinical study of 97 children with mild to moderate FTT, as defined above, 90% were below the 10th centile for body mass index (BMI), and all but one showed at least some subsequent catch up weight gain.10 This implies that such children are predominantly relatively undernourished and not simply showing an unusual constitutional pattern. Many risk factors have been identified in clinical case series, but these usually prove less clear cut in controlled studies and can disappear completely in population studies. This might be because referred populations have been selected for certain characteristics—for example, children with FTT who have oro-motor problems will be more likely to be referred to a clinic that specialises in such problems. Additional problems are posed by the varying definitions used. If a centile cut off is used there will tend to be an excess of infants with low birth weight, and apparent associations with FTT may result from confounding by risk factors for low birth weight. Finally, a comparatively rare risk factor might show an association with FTT, although explaining only a few cases. For brevity I have confined this review to the four factors most commonly mentioned: organic disease, abuse and neglect, deprivation, and undernutrition. The role of abuse and neglect in FTT has probably been overstated. Two population studies16 17 found that only between 5% and 10% of children with FTT had been registered for abuse or neglect. However the study of Skuse and colleagues16 17 found that children with FTT were four times more likely to be abused than controls, which is in keeping with various clinical series.18-20 Therefore, children in abusing or neglecting families are probably at increased risk of FTT, but such families still only comprise a small proportion of all cases of FTT. In contrast, undernutrition is strongly implicated. Most children with FTT have been found to be substantially underweight for height,11 17 23 24 although the degree of underweight is not always obvious, even to experienced clinicians.25In our clinical study,26 26A moderate to strong evidence of undernutrition was eventually found in two thirds of the children, based on a combination of history, weight gain patterns, and food diaries. Mean weight standard deviation score (SDS) over time of 97 children with failure to thrive identified by population screening. Although the growth consequences of FTT seem to be enduring there is now more reassuring evidence about its impact on cognition. Significant developmental deficits of between 7 and 10 developmental quotient (DQ) points have been found at the age of 1 year in two well conducted population based studies each of approximately 50 children with FTT.11 30 However, when followed up to the age of 6 years, no significant difference in IQ was found.31 In our larger follow up study of 107 children with FTT a small non-significant difference in IQ was seen at the later age of 8–9 years.13 In contrast, a small (n = 23) early study of stunted 4 year olds found a startling 20 point DQ difference,32 with a persisting deficit of 12 IQ points at the age of 11.33 However, the confidence limits in this study were wide and the different selection criteria make direct comparison difficult. On the whole, therefore, the evidence suggests that although FTT probably influences development in the short term, a permanent effect on brain growth is less likely. FTT does not fit many of the criteria for a screenable condition. However, it is the main condition identified by the existing programme of weight monitoring and already precipitates a large number of referrals. 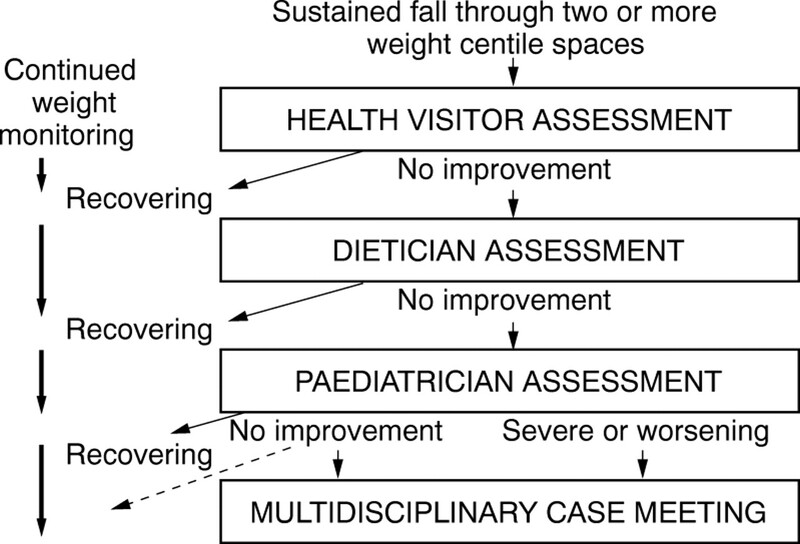 The recommendation agreed at the recent Coventry consensus meeting was that one should weigh less often, with more attention being paid to the weights that are collected (table 1).39Children need only be weighed at birth, at the time of their immunisations, and at surveillance checks until the age of 1 year, with only those causing clinical concern weighed thereafter. There was less consensus on whether explicit screening criteria should be applied to weight gain patterns. I would argue that these help staff to reassure the worried well and to identify all children with FTT: both our treatment trial12 and another study22 have suggested that up to one half of children with FTT are never identified. However, the unthinking application of rigid criteria might create worry and unnecessary referrals. If individual districts chose to apply standard criteria, such as a fall through two centile spaces identifying the slowest gaining 5%, it would have to be recognised that such children only constitute a high risk group who would merit closer investigation, rather than a definite diagnostic group. Whether identified by screening or not, FTT is common and often resolves with simple interventions. Thus, except in ill children or those with continuing weight loss, as opposed to slow or static weight gain, first line management should remain in primary care. In the UK, health visitors are ideally suited to undertake this work, with appropriate support and training, because of their statutory responsibility to families with young children. A home visit might reveal obvious dietary issues and this input alone often results in improvement.40 It is crucial that parents are told at an early stage and in simple terms that undernutrition is the likely cause, while emphasising what a common phenomenon this is. Avoiding an explicit diagnosis does not prevent parents from feeling criticised, but it may prevent them from discussing their concerns. A pathway of care for failure to thrive. A firm grasp of the energy balance equation is essential for the successful management of FTT (fig 3). However much food a child appears to be consuming, if they are underweight for height and failing to gain weight at the expected rate, or failing to catch up, they are not consuming sufficient for their needs and advice on energy enhancement is needed. It might be helpful to remember (and to explain to parents) that children's energy requirements can vary widely, as can intake from day to day, and that a greater than average energy intake will be required for catch up growth. The assessment might suggest a range of possible interventions (table2). It is sensible to decide with parents which would be most feasible or acceptable. Whatever advice is offered it should be summarised in writing, ideally in the form of a letter to the parents, with copies going to the health visitor and any other professionals involved with the family, to allow reinforcement and avoid conflicting messages. Arriving at a reliable diagnosis by integrating the weight gain pattern with an accurate measurement of length and parental heights usually requires the involvement of a paediatrician, although chart reviews will suffice in most cases. However, if medical causes are suspected, a consultation will be required. If investigations are undertaken they should be completed promptly, ideally at one visit. Our routine screen usually comprises full blood count and ferritin, renal, and thyroid function tests, anti-endomesial antibodies, and mid stream urine, with chromosome analysis in girls and a chestx ray and sweat test in very young infants, or where there is a history of respiratory infection. However, our experience,10 in common with others,41 42 is that laboratory investigations alone reveal no occult disease. In fact, when major organic disease was found (even potentially occult conditions such as coeliac disease) the children presented as obviously ill. Thus, most tests are undertaken to exclude pathology rather than to arrive at a diagnosis. Once this has been achieved, the paediatrician should reiterate the likely nutritional cause and ideally refer back to mainly health visitor management. When the paediatrician is the first point of referral, having ruled out organic disease, the challenge is to engage the child's health visitor and involve her in the further assessment and management of the child, with or without the help of a dietician. This approach requires active collaboration between paediatricians, health visitors, and dieticians, but is repaid by the saving in hospital attendances,12 and the increased competence and independence of community staff. AND IF AT FIRST YOU DON'T SUCCEED . . .
Research findings over the past 15 years suggest that slow weight gain is a common feature of early childhood which, although weakly associated with social or medical ills, most commonly occurs in isolation. The term “failure to thrive” tends to be seen as perjorative and many clinical staff are reluctant to make the diagnosis in otherwise “blameless” families. There is an argument for avoiding the term “failure to thrive” and relying instead on the more specific terms “slow weight gain” and “undernutrition”. None of the foregoing would have been possible without the long labours of the health visitors of Newcastle, the members of the Parkin service team, and the support of Newcastle City Health, Newcastle and Durham Universities, and the NSPCC. The programme was started by Mike Parkin before his untimely death in 1990. This work was funded by the Wellcome Trust, Henry Smith Charity, Northern and Yorkshire NHS, and Newcastle Hospitals Special Trustees. (1960) Failure to thrive: role of the mother. Pediatrics 25:717–725. (1985) Non-organic failure to thrive: a reappraisal. Arch Dis Child 60:173–178. (1984) Textbook of paediatrics (Churchill Livingstone, Edinburgh), 3rd ed..
(1985) Summary of discussion at NIMH conference October 1984: new directions in failure to thrive research implications for prevention. in New developments in failure to thrive. ed Drotar D (Plenum Press, New York), pp 369–375. (1989) Failure to thrive. A continuing problem of definition. Clin Pediatr (Phila) 28:391–394. (1994) What is the normal rate of weight gain in infancy? Acta Paediatr 83:351–356. (1998) New chart to evaluate weight faltering. Arch Dis Child 78:40–43. (1993) A comparison of the use of Tanner, NCHS and Cambridge weight standards in infancy. Arch Dis Child 69:420–422. (1998) Weight monitoring chart: for children with slow weight gain. (Harlow Printing, South Shields). (1996) The Parkin project: a study of screening and intervention in failure to thrive [MD thesis]. (University of Newcastle upon Tyne). (1992) Failure to thrive: clinical and developmental aspects. in Developmental psychopathology. eds Remschmidt H, Schmidt MH (Hogrefe and Huber, Lewiston, NY), pp 46–71. (1998) Community based managment of failure to thrive: a randomised control trial. BMJ 317:571–574. (1999) Cognitive and educational attainments at school age of children failed to thrive in infancy: a population based study. J Child Psychol Psychiatry 40:551–561. (1985) Diagnostic classification: the current challenge in failure to thrive syndrome research. in New developments in failure to thrive. ed Drotar D (Plenum Press, New York), pp 225–233. (1989) Prospective evaluation of weight gain in both non-organic and organic failure to thrive children: an outpatient trial of a multidisciplinary team intervention strategy. J Dev Behav Pediatr 10:27–31. (1995) Failure to thrive and the risk of child abuse: a prospective population study. J Med Screen 2:145–149. Wright C, Birks E. Risk factors for failure to thrive: a population based survey. Child Care Health Dev. [In press.]. (1988) Growth patterns in child abuse. Acta Paediatr Scand Suppl 343:62–72. (1969) Failure to thrive and fatal injury as a continuum. Am J Dis Child 118:565–567. (1977) The spectrum of failure to thrive and child abuse. A follow up study. Child Abuse Negl 1:119–124. (1994) The effect of deprivation on weight gain in infancy. Acta Paediatr 83:357–359. (1990) Failure to find failure to thrive. (Whiting and Bush, London). (1985) Early preventive intervention in failure to thrive: methods and preliminary outcome. in New developments in failure to thrive. ed Drotar D (Plenum Press, New York), pp 119–138. (1995) A randomized clinical trial of home intervention for children with failure to thrive. Pediatrics 95:807–814. (1995) Clinical examination compared with anthropometry in evaluating nutritional status. Arch Dis Child 72:60–61. (1995) A population approach to weight monitoring and failure to thrive. in Recent advances in paediatrics. ed David TJ (Churchill Livingstone, Edinburgh), pp 73–87. Wright C. Failure to thrive in a population context: two contrasting case control studies of feeding and nutritional status.Proc Nutr Soc. [In press.]. (1994) Weaning and the weaning diet. (HMSO, London). (1985) A strategy for managing non-organic failure to thrive based on a prospective study of antecedents. in New developments in failure to thrive. ed Drotar D (Plenum Press, New York), pp 211–222. (1987) Growth at age of 4 years subsequent to early failure to thrive. Child Abuse Negl 11:35–40. (1996) A community based study of failure to thrive in Israel. Arch Dis Child 75:145–148. (1997) Maternal characterstics and the development of children who failed to thrive (PhD thesis). (University of London). (1987) Growth retardation and developmental delay among inner-city children. J Child Psychol Psychiatry 28:529–541. (1998) Short normal children and environmental disadvantage: a longitudinal study of growth and cognitive development from 4–11 years. J Child Psychol Psychiatry 39:1017–1030. (1984) Hospitalised cases of non-organic failure to thrive: the scope of the problem and short term lay health visitor intervention. Child Abuse Negl 8:229–242. (1988) Prediction of intellectual development in young children with early histories of non-organic failure to thrive. J Pediatr Psychol 13:281–296. (1999) A randomised controlled trial of specialist health visitor intervention for failure to thrive. Arch Dis Child 80:500–505. (1999) Failure to thrive in young children: research and practice evaluated. (Children's Society, London). , ed (1998) Failure to thrive: a teaching pack for health professionals. (Harlow Printing, Newcastle). , ed (1998) Find them by five. (Child Growth Foundation, Coventry). (1996) Screening for failure to thrive—what are we looking for? Child Care Health Dev 22:223–234. (1978) Failure to thrive. The role of clinical and laboratory evaluation. Am J Dis Child 132:967–969.